The summer of comics continues. I enjoyed X-Men and Thor for what they were, and I decided to hold off on Green Lantern as the previews didn’t show anything that I needed to pay to see. I can’t say that the previews for Captain America did, either. But they didn’t turn me away, and it is summer, and I have kids who like going to movies… or at least Cherry ICEE’s. So, off we went. I read Captain America comics as a kid sporadically. He didn’t feel like a Superhero because he didn’t stick to walls, run like a Flash, see things with an internal radar, or fly. So why spend 25 cents when there’s other comics with people who do? If the movie does anything well, it introduced me to the origin of the character. If I knew, I had forgotten. I liked the movie, but even during it, I had the feeling that I had seen all of this before. Like what? Raiders of the Lost Ark: Nazis like items of immense mystical power. 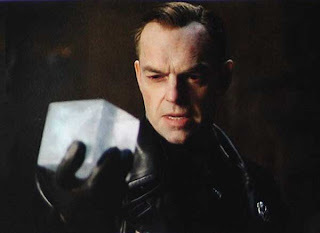 The Ark of the covenant didn’t quite work out for them in Raiders, and the Tesseract similarly draws Red Skull here. Star Wars: You perhaps remember Stormtroopers who shoot from the hip and hit everywhere but on target. Here, they trade in their bleached whites for black gear and lasers that Stormtroopers can only wish they had, but fail against GI’s with regular machine guns. It’s sad, really. Return of the Jedi: Remember when Luke and Leia are weaving through the forest of Endor on speeders, being chased by aimless Stormtroopers? Captain America is a bit more grounded, but it’s all the same. The Lord of the Rings/Benjamin Button: Computer Generated Imaging makes Capt. America scrawny at the beginning, just as hobbit actors were shortened and Brad Pitt aged. It’s done really, really well, though. Avatar: Colonel Miles Quaritch was as one dimensional as a “villain” can be, basically bad for no other reason than he’s just bad. Red Skull? He definitely looks the part, and Hugo Weaving excels at portraying characters with no range (Agent Smith in Matrix, Elrod in Lord of the Rings – I’d point out that this is a script issue, he excels in V for Vendetta). Still, even James Bond movies do a better job at fleshing out megalomaniacs. The Mask: Jim Carrey speaks humor. Not so with Red Skull. X-Men: First Class: This movie succeeded in part by capturing the Cold War era so vividly. Here, we’re thrown back to World War II. Captain Skyhawk and the World of Tomorrow: And speaking of WWII, stylistically, the effects in Captain America resonate with this film, gorgeous in its comic panel visualizations, resonant in its fascist imagery, and disappointingly brief in its romantic touches. Gee, what else is there not to like? Marvel Comics is supposed to excel at giving their characters real lives, a sense of soap operas in their lives. We understand that Steve Rogers (aka Captain America) wants to fight in the war, but when it’s all said and done, even the doctor who juices him from wimp to beefcake admits he’s a good guy. Red Skull, bad. Captain America, good. Remember, I liked the movie. So, what is there to like? Well, Peggy Carter, for one. Not quite a girlfriend, the sharpshooter breathes life into every “I’m just a good guy” scene she enters. We’re never told exactly who she is and why she’s there, but we’re glad she is. Marvel Exec Producer Stan Lee has had cameo roles in most if not all of the Marvel films. His delivery here is perfect. Tommy Lee Jones. I didn’t pay attention to who was in the movie, but when you need an authoritative or military presence, yes. He’s your guy. Superhero movies, both for character development and necessity, focus on the origin of the character’s powers. Captain America takes a playful look at the US War Bond sales efforts, a clever blend with the origins of the comic book, rather than hero. Yes, yes, there’s much that’s been seen elsewhere. Since when did Hollywood start creating something original? This movie was better than I expected, neatly telling a narrative amidst captivating fight scenes (in particular, a shield as an offensive weapon) and excellent special effects. Red Skull, if anything, is a villain you want to see get his due. The problem is, I’d like to see more of him. As Captain America will shortly be enlisted in the modern era Avengers movie next summer (to the writers’ credit using the same plot device that he had originally been aged from WWII to the 1960’s in the comics), I think we’ve seen the last of Red Skull. Credit also should be given for giving more than just a tease of the Avengers after the final credits have rolled. Check your brain at the door and just be entertained. Hey, it’s a comic book. yes you right. i agree with your opinion. some movies don't have any attraction on us but some have. Nice review. I actually slept through a good portion of the whole "middle"...it just wasn't exciting enough as I'm used to super-hero movies being. But, it wasn't bad. It was just kinda...well...meh.